Contains NO sulphates, fluorides or mineral oils. 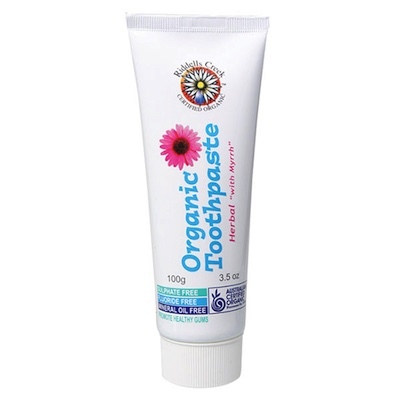 Riddells Creek Certified Organic Toothpaste cleans and brightens teeth and freshens the mouth with sodium bicarbonate and organic peppermint. An organic blend of aloe vera, peppermint, parsley, thyme, rosemary and sage. Completely free of synthetic chemicals and fluoride, Riddells Creek Toothpaste is an effective natural alternative.